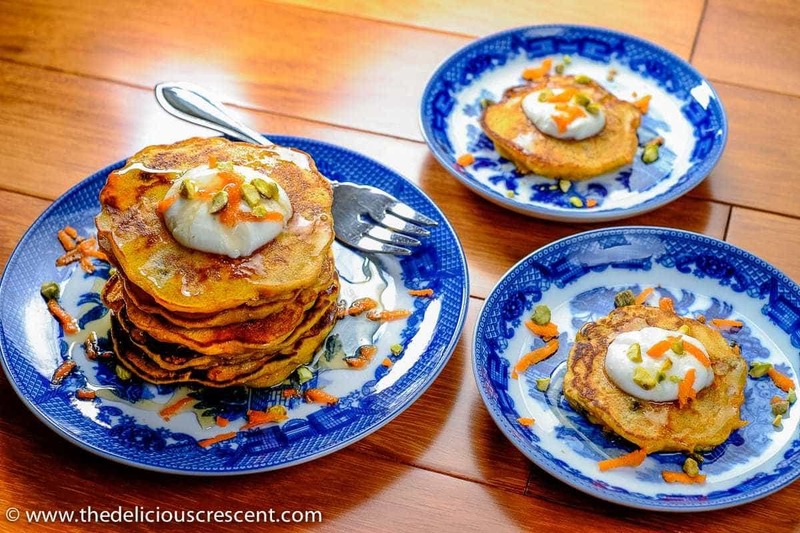 Cardamom scented dessert style carrot pancakes are a healthy treat for your morning weekend breakfast. An easy recipe with a delightful blend of spices, almonds or cashews, raisins served with an amazing rose water flavored ricotta cream. 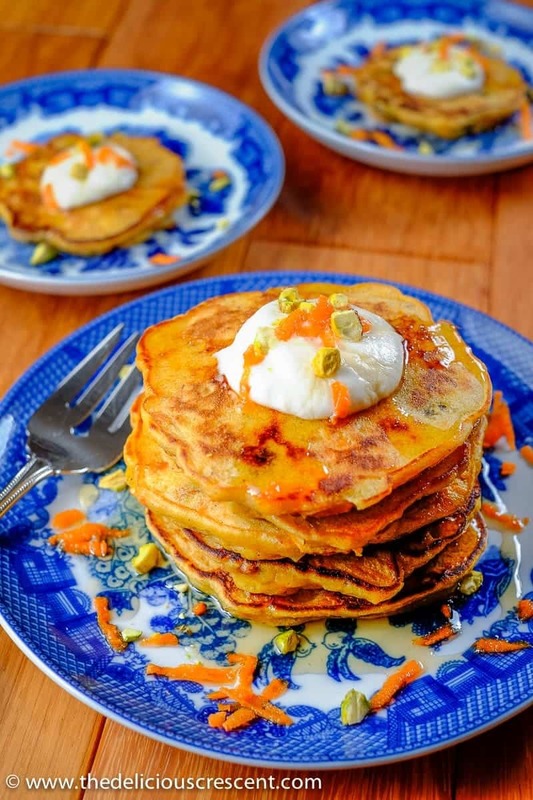 These nutrient dense pancakes are reminiscent of a dessert but not loaded with the calories and fat. Carrots are a rich source of carotenoids – the powerful antioxidants, which are well known for their potential to lower the risk of cancer. Beta carotene from carrots can help correct vitamin A deficiency. Carrots being a good source of phytochemicals and fiber can help with promoting good health and prevention of several diseases. I have used almonds for these pancakes and have previously discussed about it in my post about Anise Almond Honey Biscotti and have used it for Rose Rice Custard with Pomegranate Jelly. And I prefer to use white whole wheat flour as it is wholesome and have successfully used whole grains in other baked foods – Chocolate Hazelnut Honey Crescent Rolls and Light and Delicious German Apple cake. For the ricotta cream, I start with low fat ricotta but add a little bit of brown butter (ghee) which gives it an amazing flavor. One serving of these pancakes provides about 2/3 of a vegetable serving. 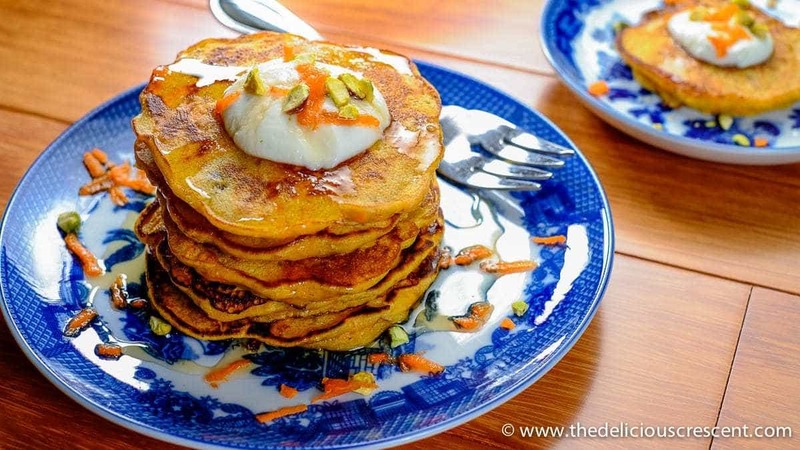 So moms, with these Carrot Pancakes you can trick everyone into doing what you like – making them eat veggies!! Combine flour, nuts, raisins, cardamom, baking powder and salt in a mixing bowl. In a separate bowl, combine eggs, brown sugar, buttermilk, olive oil and rose water. Add the wet ingredients to the dry ingredients and gently stir, making sure not to over mix. Drain the raisins well. Add the grated carrots, raisins and carefully stir it in. The consistency should be thick but spreadable. If you use smaller eggs, make sure to increase the amount of buttermilk to adjust the consistency. Heat a skillet over medium heat. Use the cooking spray or lightly coat the pan with oil. Using a 1/4 cup measure, pour the batter on the heated skillet, carefully spread it into pancakes and cook for about 2 minutes. When you notice bubbles on the top, flip the pancakes and cook for 1 to 2 minutes until it is well cooked. Whisk the ingredients for the topping and whip up the ricotta cream. Or you may process it together in a blender. 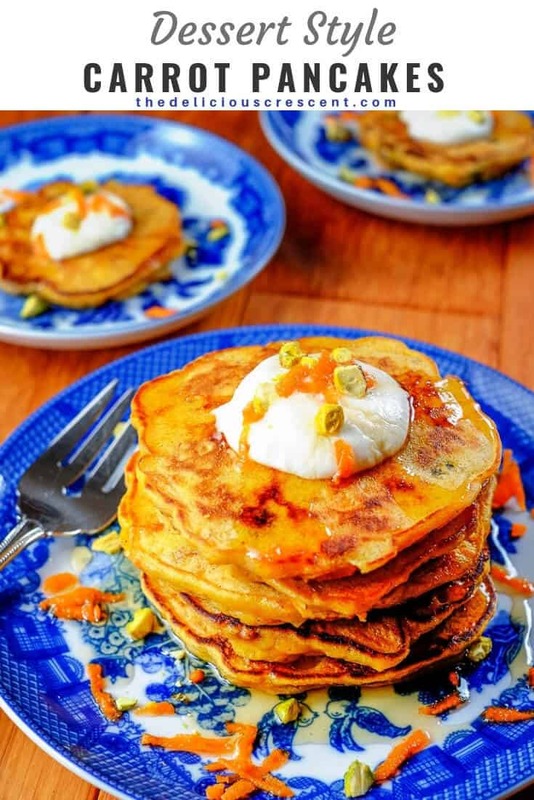 Serve the Carrot Halwa Pancakes with the ricotta cream. And a drizzle of maple syrup if you like. 1. 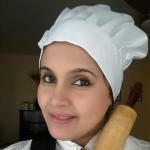 For flour, you may also use a mix of white whole wheat flour or whole wheat pastry flour with all purpose flour. 2. If using cashew nuts, you may toast them before adding to the batter. 3. If you prefer to use some Greek yogurt in the topping, make sure to use the one that is not overly fermented and tart. Thanks Rafeeda ?. Thanks for adding me too. So glad to be in touch.